Once-beaten southpaw Yuandale Evans (20-1, 14 KOs) had Cleveland’s fight fans on their feet for the final two dramatic rounds as the East Cleveland boxer earned an exciting, all-action split decision victory over previously undefeated featherweight Luis Rosa (23-1, 11 KOs) in the 10-round main event. Two judges scored the fight in favor of Evans – 96-94 and 97-93 – while the third judge had Rosa winning, 96-94, on Friday night at The Masonic at Templelive Cleveland. It was a night that saw three previously undefeated fighters lose their unbeaten records. Rosa became the 171st fighter to lose his undefeated record in the 16-year history of ShoBox. In the telecast’s first fight, heralded Cleveland boxer and 2016 U.S. Olympian Charles Conwell made his television debut and improved to 6-0. But it was the Evans-Rosa fight that fans won’t soon forget. The Evans-Rosa war included 611 total connected punches and 512 landed power shots were exchanged. There were multiples shifts of momentum throughout the fight as Rosa commanded the early rounds with volume and power while Evans rallied in the middle rounds. Rosa led 268-267 in total connected punches entering the final round, but Evans summoned a huge rally in the 10th (49 of 103 to 27 of 88 for Rosa) to seize a 316-295 overall lead to earn the split-decision victory. In the co-main event, undefeated Russian standout Radzhab Butaev (8-0, 6 KOs; WSB: 9-1) earned a hard-fought unanimous decision over Colombia’s previously unbeaten Janer Gonzalez (18-1-1, 15 KOs) in an eight-round welterweight matchup. The three judges scored the fight, 80-72, 79-73, 77-75, in favor of Butaev. It was a technically sound fight between two accomplished former amateur standouts. Butaev, who dominated from the early rounds, connected on 41 percent of his power punches (66 of 162) compared to 27 percent for Gonzalez (47 or 173). 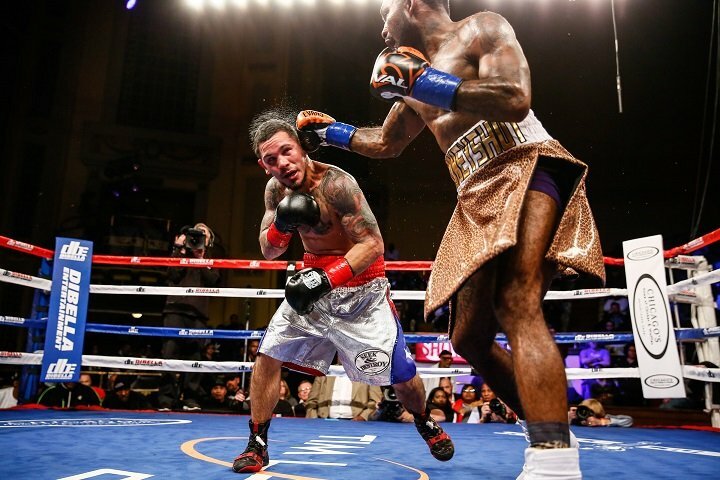 In the second fight of the four-fight telecast, a matchup of undefeated heavyweights, 28-year-old Junior Fa (13-0, 8 KOs) knocked out Pittsburgh’s Freddy Latham (9-1-2, 5 KOs), handing him the first defeat of his pro career just 67 seconds into the fight. It was the 169th time a fighter has lost his undefeated record on the ShoBox series. New Zealand’s Fa sent the former Golden Gloves champion Latham back-pedaling from the opening bell with a barrage of punches as referee Clifford Pinkney jumped in between the fighters. Latham, who had never been stopped, struggled to keep standing as he leaned against the ropes. Click HERE to watch video of the stoppage. “I was actually going to keep on going, continue fighting but then he dropped. He was out of it. The ref pulled me back,” said Fa, who earned a first-round knockout for the sixth time of his career. Fa landed 59 percent of his power shots (17 of 29) while Latham managed to land just one of four power punches. In the telecast opener, 2016 U.S. Olympian and local favorite Charles Conwell (6-0, 5 KOs) –buoyed by a huge third round where he scored two knockdowns and another in the fifth – went the six-round distance for the first time in his young career finishing off a game Roque “Rocky” Zapata (4-2-3) with an impressive unanimous decision victory scored 60-51 twice and 60-53. The super welterweight contest was dominated by Cleveland’s 20-year old Conwell, who used effective body shots to do the most of the damage as he accounted for 80 of his 175 total connects and 75 of his 150 power punches. Conwell caught the former MMA fighter Zapata in the third round with a strong right cross. It was the first time Zapata, who came into the fight with a three-bout winning streak, had ever hit the floor in his career. Click HERE to watch video of KOs in round 3. A left hook by Conwell in the latter stages of the third round dropped Zapata for the second time. Zapata hit the canvas once again in the fifth after a devastating left hook to the body followed by a left hook to the chin. The Culpepper, Va. native stood up at the nine-count and finished the stanza. Friday’s quadrupleheader will replay on Monday, Nov. 13 at 10 p.m. ET/PT on SHOWTIME EXTREME and will be available on SHOWTIME on DEMAND® and SHOWTIME ANYTIME®. The fights were promoted by DiBella Entertainment. Barry Tompkins called the ShoBox action from ringside with Farhood and former world champion Raul Marquez serving as expert analysts. The executive producer was Gordon Hall with Rich Gaughan producing and Rick Phillips directing. Previous boxing news: The Bomber vs. The Animal, WBF World Championship Boxing In Essen!